Thursday April 28th 1898 It was a windy disagreeable day. I went down in the field in the morning after Charlie as Emma was worse. She died at three oclock. I was over after that. I did a little sewing during the day. Friday April 29th 1898 I went to town early this morning with the butter. I brought John Garnett home with me. Father & Mother got here jist as we did. Mother and I were over to the other house a little while. They went home early. I had a lot of work to do after they went. wrote to Laura. Saturday April 30th 1898 It was raining early but cleared up so we went up to McCords to dinner, had a very pleasant visit. I was busy till bed-time after I came home. John went with us. Sunday May 1st 1898 I was all forenoon getting dinner ready for the folks at home but they did not come till time for the funeral at two oclock. I staid over there till time to do my evening work. It was so late that we did not try to go to town. Jeff & Lettie come back here for late supper and did not go home till half past ten. 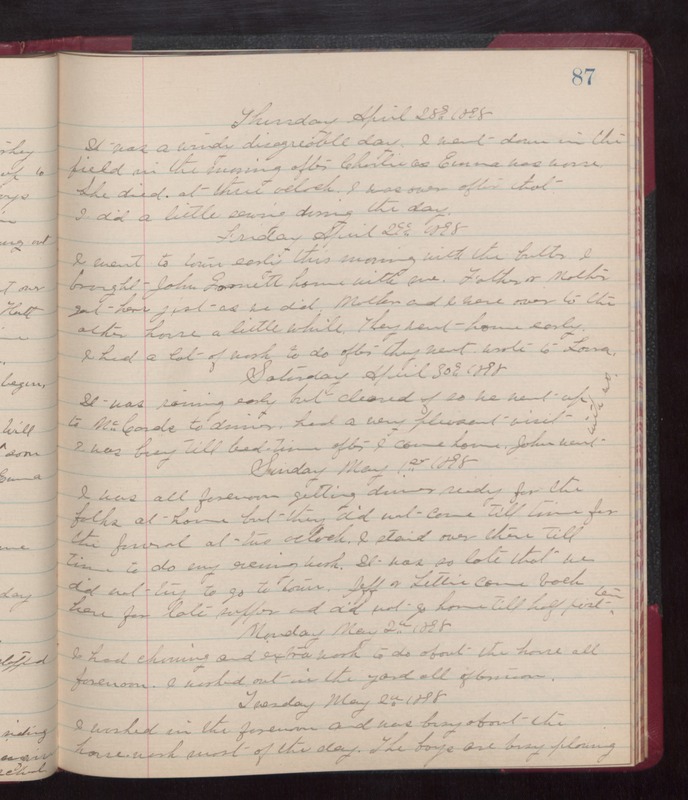 Monday May 2nd 1898 I had churning and extra work to do about the house all forenoon. I worked out in the yard all afternoon. Tuesday May 2nd 1898 I worked in the forenoon and was buys about the house work most of the day. The boys are busy plowing.